Injuries to these areas are commonly the result of ergonomic stresses and strains at home or in the workplace, or repetitive trauma causing irritation or injury to ligaments and connective tissue, muscles, joints and nerves. Falls onto the outstretched hand can cause soft tissue or bony injuries to the upper limb and hand, finger injuries from contact during sport. Tennis and golfers elbow, and carpal tunnel syndrome are a few of the common conditions that we treat at Radius Physiotherapy. At Radius we will assess the upper limb, looking at the history of the injury, the implications of work station ergonomics or daily/ sporting activities. Sometimes there can be spinal involvement and pain or symptoms referring from your neck or thoracic spine. We will ascertain the source of the problem, provide a diagnosis and treat as appropriate. This may involve joint or soft tissue mobilisations. It will usually involve postural advice and a progressive range of mobilising and strengthening exercises. We aim to help with sport or activity specific advice and exercise to prevent recurrence of the injury. If necessary onward specialist consultant or MRI referral can be organized. 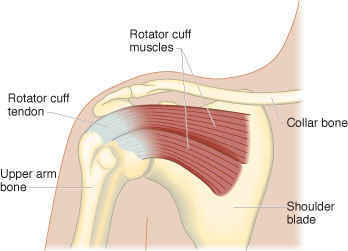 Shoulder impingement syndrome, also called painful arc syndrome, is a common shoulder problem which occurs when the tendons of the rotator cuff muscles become irritated and inflamed as they pass through the sub-acromial space, the passage beneath the acromion (end of the shoulder blade and collar bone). This can result in pain, weakness and loss of movement at the shoulder. The pain is often worsened by repetitive shoulder overhead movement and may occur at night, especially if lying on the affected shoulder. Impingement syndrome is usually treated conservatively. Treatment includes rest, avoiding painful activity, and physiotherapy. Our physiotherapists would typically focus at maintaining your range of movement, improving your posture, strengthening of your muscles and reduction your pain. Treatment techniques to improve pain and function include joint mobilization, acupuncture, soft tissue massage, therapeutic taping, scapular and rotator cuff strengthening, and education regarding the cause and mechanism of the condition. Anti-inflammatories and ice packs may be used for pain relief. Frozen shoulder is a painful condition that affects movement of the shoulder. The most common symptoms are pain and stiffness in your shoulder, in particular reaching up and reaching behind your back to tuck in a shirt. You may also have pain at night. Frozen shoulder is caused when the flexible tissue that surrounds the shoulder joint, known as the capsule, becomes inflamed and thickened. It is not fully understood why this happens, although there are a number of things that make developing a frozen shoulder more likely. Frozen shoulder may last over a period of 18-36 months. However, with appropriate treatment it is possible to shorten the period of disability. Our physiotherapists will help to keep your joint as mobile and pain free as possible while your shoulder heals. The type of treatment you receive will depend on how severe your frozen shoulder is and how far it has progressed.Treatments include acupuncture for pain relief, soft tissue massage, joint manipulation and exercises. You may find heat helps with the pain in your shoulder. 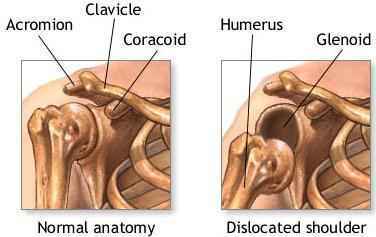 Shoulder dislocation can result from a trauma to your shoulder. The humerus (arm bone) becomes detached from its socket and moves out of alignment. This usually requires re-location in A&E. Sometimes the joint subluxes or partially dislocates which may ‘pop’ back in by itself. This may leave you with a joint that is ‘unstable’ and if it happens more than once you may require an operation to strengthen the shoulder capsule. Physiotherapy will be very important after a shoulder dislocation to strengthen the shoulder muscles and restabilise the joint. Our physiotherapists will provide you with a progressive strengthening programme to enable you to reeducate your Rotator cuff and deltoid muscle with scapula stablisation for your unstable shoulder. 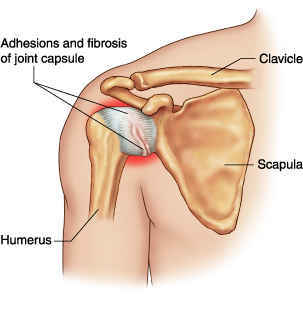 Sometimes the shoulder dislocates without trauma – for example if you have hypermobile joints and the capsule around the shoulder is lax – this is known as multidirectional instability. Symptoms include shoulder and arm pain, clicking and a feeling of slipping in the joint. Progressive exercises and controlled shoulder strengthening can have a very beneficial outcome for pain and instability. There are a variety of mechanisms that can cause injuries to the forearm and hand. Injury can be due to ergonomic stresses and strains in the workplace or at home. Repetitive trauma can cause irritation or injury to ligaments and connective tissue, muscles, joints and nerves. This is sometimes known as work related upper limb disorder. Other common injuries which may be related to sporting activities are tennis elbow /golfers elbow, a condition that results in pain around the outside (or inside) of the elbow. It often occurs after strenuous overuse of the muscles and tendons of the forearm, near the elbow joint. Irritation of the nerves as they leave the joints (vertebrae) in the neck can also refer pain into the elbow and hand. This can also produce symptoms such as numbness, tingling or burning in the elbow (often similar to tennis elbow symptoms) forearm or fingers. Nerves can also be irritated by pressure locally – pressure of the median nerve as it passes through the soft tissues in the wrist (over the carpal bones) can cause burning or tingling in the thumb, index and middle finger and ring finger, this is called carpal tunnel syndrome. Trauma such as a falls onto the outstretched hand can cause soft tissue or bony injuries to the upper limb and hand, finger injuries from contact during sport. Our physiotherapists will assess you by looking at the history of the injury and the symptoms that you have, whether there was trauma involved, and the implications of work station ergonomics or daily/ sporting activities. We will ascertain the source of the problem, provide a diagnosis and treat as appropriate. This may involve joint or soft tissue mobilisation, the use of sport tape and appropriate postural advice and progressive strengthening exercises. Poor ergonomics at work or poor movement patterns related to sporting activities will be addressed.We give sport or activity specific advice and exercise to prevent recurrence of the injury.